A number of major supermarkets have recalled some products advertised as gluten-free because they may actually contain gluten. An alert for Asda, Sainsbury's, Waitrose, Tesco and Morrisons has been issued covering products including pitta bread and pizza bases. The Food Standards Agency said items "are a possible health risk" for those with a gluten allergy or intolerance. The affected products were all made by a bakery run by food company Genius. It said the risk to consumers was very low according to the industry standard. A spokesman added: "Recall procedures have been put in place in order to ensure the safety of all customers which, as always, remains our first priority." It is believed the products were contaminated by a dry ingredient used in the baking process. In a post on its website, Asda said customers who had bought gluten-free pizza bases, garlic and coriander naan breads or white pitta breads with certain best-before codes should return them for a refund. "We are very sorry for any inconvenience caused and will ensure this doesn't happen again", it said. The Sainsbury's alert applies to pizza bases, multiseeded and white pitta breads, sultana scones, garlic and coriander naan breads and syrup pancakes with certain best before dates. The supermarket wrote: "As a precautionary measure, we are asking all customers who have bought these products to return them to their nearest Sainsbury's store, where they will receive a full refund. "No other Sainsbury's products are affected by this issue, and we apologise for the inconvenience this may cause." Waitrose also said customers should return its own-brand gluten-free pancakes, pitta and scones with certain best-before dates for a refund. It said: "Any customers who have a reaction to gluten should not consume these products." 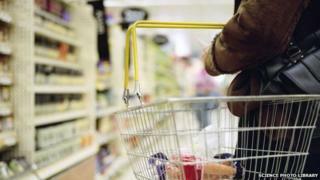 The FSA said Tesco's "Free From" garlic and coriander naan, crumpets, pizza bases and pitta bread were being recalled. Morrisons is also recalling its "Free From" pizza bases. Genius said those allergic or intolerant to gluten should not consume its crumpets, Livwell Garlic Naan or Livwell Gluten Free Crumpets. The company said the affected products had tested between 5-80 parts per million, the measurement used to test the amount of gluten in food. Products which test between 21ppm and 100ppm are considered "very low risk, although not officially gluten free", it said. It added: "If you are Coeliac or suffer from a wheat/gluten allergy and are showing signs of being unwell or a family member is showing signs of being unwell, please contact your local doctor for immediate advice. "If you do not have Coeliac Disease or an allergy to wheat/gluten these products are safe for consumption."